Barcelona: the most popular club on the planet these days. Wayne Rooney: one of the most popular players on the planet these days. Unrelated as they might be, surveying the metaphorical terrains in which they currently find themselves in, it’s awfully easy to get confused where both club and player are going at this point in time. the only thing worse than another defeat to milan for barcelona? those god awful tequila sunrise kits. Charting their success over the last few years, the blaugrana have looked permanently perched to the top of the highest peak imaginable in the club game. No other club can claim to have had such a great stretch. Barça’s run of unbelievable sustained success has been experienced by few — if any — clubs in the modern era, and is only rivaled by that of their greatest foes to the North in the late 1950’s. Two Club World Cups, Champions League winners thrice over, five La Liga titles and a pair of Copa del Rey’s only tell half the story, as they’ve also been to four European semifinals and a handful of others as well. So when they’re not winning it all, they’ve at least been in the running. Likewise, Wayne Rooney has been at or around the pinnacle of the English and footballing worlds for quite some time. He’s been a virtual lock as a starter at United since 2004, has been an integral part of four Premier League titles, a Champions League title, and a Club World Cup title, not to mention a bevy of individual awards to bolster his trophy cabinet. He’s been the centerpiece upon which Sir Alex Ferguson built his Manchester United squad, and the same can be said about England. 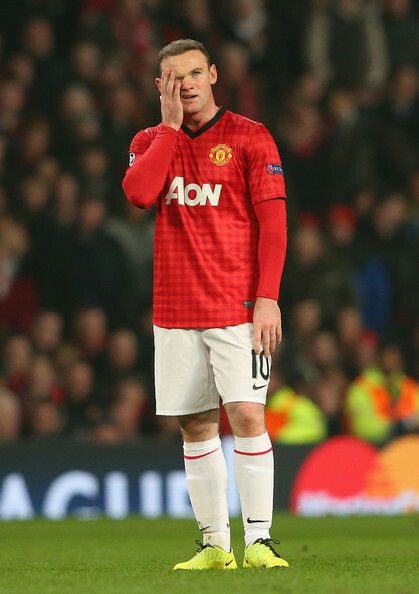 But in what is undoubtedly a mere coincidence, both Barcelona and Rooney have experienced a bad couple of weeks. Following three unsettled defeats from four from Barcelona, and a curiously turbulent and dramatic season for Rooney, I’ve begun to wonder if both of their times at the top of the game might be drawing to a conclusion. For Barça, could those loses mean that they’re on the downside of the hill, that they’ve reached the end stages of this incredible run? For most, the loss to A.C. Milan and a pair of losses to Real Madrid will probably be written off as anomalies or attributed to a poor run of form. Both of which could certainly be the case. But upon closer inspection, there are worrying trends developing over this season that’s appears to indicate that there are cracks in the foundation of the first team. First and probably foremost, Barcelona have become increasingly overdependent on Messi for their goals. Lucky timing for them of course, as this over reliance is comes at a time when the guy is scoring goals at a rate that’s practically unprecedented in the modern game. But in this poor run of games, Messi has himself suffered an individual dip in form. As the Messiah goes, so goes your club apparently. The Catalunyans have also struggled to find someone to place at the apex of their attack: should we play a false nine with Messi up top, or is the aging David Villa going to cut it any longer? And too, they’ve struggled in the absence of manager Tito Vilanova who’s having treatment on a recurrence of cancer. Xavi isn’t getting any younger. Neither is Puyol. Valdes is leaving at the end of the season. Piqué looks to have lost interest at times. And while there’s always a talented cartel of youngsters coming through at Barcelona, are any of them Xavi, Iniesta or Messi good? What about Cesc good? Reinforcements are needed in the short-term, and an overhaul is on the horizon. things haven’t gone so well for rooney lately, and whether he’ll be able to get back on track in manchester seems to be the question everyone is asking. Rooney’s decline, although much more gradual, has been far more pronounced. Always a the spitfire, we should have seen the seeds of his problems years ago. A lack of focus/professionalism seemed at the heart of his problems, beginning with multiple allegations of sleeping with prostitutes as early as 2004. However, Rooney’s situation really began to escalate when the England star declared he wanted to leave United at the beginning of the 2010 season. Reportedly overweight and out of shape, Rooney was sent to fat camp in Oregon for a few weeks before returning to Manchester to sign a new contract, smile for the cameras and tell everyone that everything is okay. Yet, it remains clear, things are definitely not okay and it seems ever more clear that his relationship with Sir Alex is strained. Ask Roy Keane, David Beckham and Ruud Van Nistelrooy — all former United legends themselves — how well that normally goes over with Fergie. He’s been repeatedly left out of United’s starting eleven’s since then due more to disputes than to the tactical choices they’re often attributed. And perhaps the biggest indication that Wazza’s star is fading was the purchase of Robin van Persie in the summer. With RvP and youngsters like Danny Wellbeck and Ángelo Henríquez waiting in the wings, suddenly Rooney might find himself an extremely expensive and disruptive surplus to requirements. Look, I know I’m being sensationalist here. Barcelona are still Barcelona. And though they might be on the cusp of an “early” Champions League elimination, and a pair of humbling defeats to hated rivals Madrid, they’re still 16 points clear in the league. And Rooney is still just 27, in his prime, and has ample time to get his act together and prove any doubters wrong. But that doesn’t mean there isn’t reason to be alarmed. Which of Rooney or Barça is better prepared to transition in the short-term, however, remains to be seen. “Who needs another upgrade? Be ready to get new soft for your Macbook”?.